"We want women from all backgrounds of the industry and at every stage in their career to fulfil their potential and realise their dreams. We value openness, honesty and a positive approach towards collaborating with women and mean across the UK to achieve our mission. Our vision is to see a change in the UK's animation and VFX industries. We want to support a network of women who can help each other achieve success at every stage of the animation or VFX pipeline. This change will be visible when we see results such as: better female characters on screen, an increase in women–led start–ups and an increase in women winning awards in technical areas." 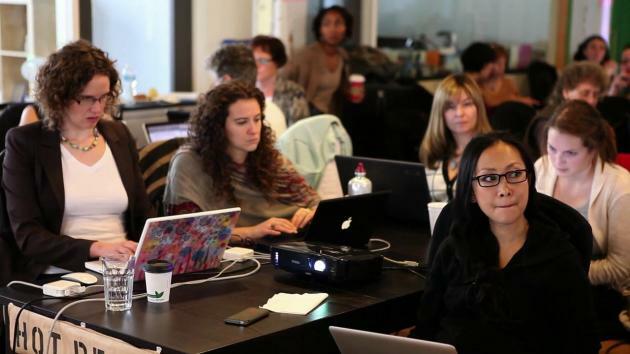 "Ladies Learning Code is a Toronto–based not–for–profit organization that runs workshops for women (and men) who want to learn beginner–friendly computer programming and other technical skills in a social and collaborative way. Today we have chapters across Canada, a thriving girls' program called Girls Learning Code and a permanent workshop space in Toronto. Oh, and we're just getting started." "Women from all different background and experiences came together for the common mission of using our voices to further the recognition of women as filmmaking leaders. This short film was created and shot at POSH 2010 after lengthy discussions about our shared experiences in an industry dominate by men. The film showcases the talent, passion and emotional connection of women in the film industry with a positive and powerful message: We Create." Fig.1 Shot on location at POSH 2010, 'We Create' was directed by Maura Coleman–Murray and Kara Jensen, filmed by Maribeth Ratajczyk and Luiza Perkowska, and edited by Meg Simone. All 42 POSH 2010 attendees collaborated on the piece.